Successful DIY Nail Repair With A Tea Bag! If you saw my post yesterday, you know that I was dealing with a broken nail on the middle finger of my left hand and hoping to fix it myself at home using a common household item: a tea bag. Nail, post-repair. Got the nail glue at Walgreens for around $4. Well, I actually did the repair this afternoon, and so far I would have to call it a success. I’m very excited about this, as it’s actually the first time I’ve tried to repair a nail. It’s the first major crack I’ve had since starting Polish Groupie in May that was so far down the nail that it really would have been disastrous for my blogging. Here’s a quick rundown of how I did it, plus a link to the video tutorial I used as a guide. 1. Start with a clean nail. After polish removal, use a cotton ball to wipe nail polish remover or rubbing alcohol on the clean nail to remove any leftover residue from oil, hand lotion, etc. 2. Use scissors to cut the top off of the tea bag. Empty out the tea and cut or peel apart the bag so that it lays flat. 3. Cut out a rectangle from the tea bag that is slightly wider and quite a bit longer than your nail. Use scissors to cut the rectangle down so that it matches the width of your nail bed and so that one end mimics the curve of your cuticle line. You want it to fit as close as possible to the exact size of your full nail, but leave it longer so that it sticks out well past the end of the nail. 4. 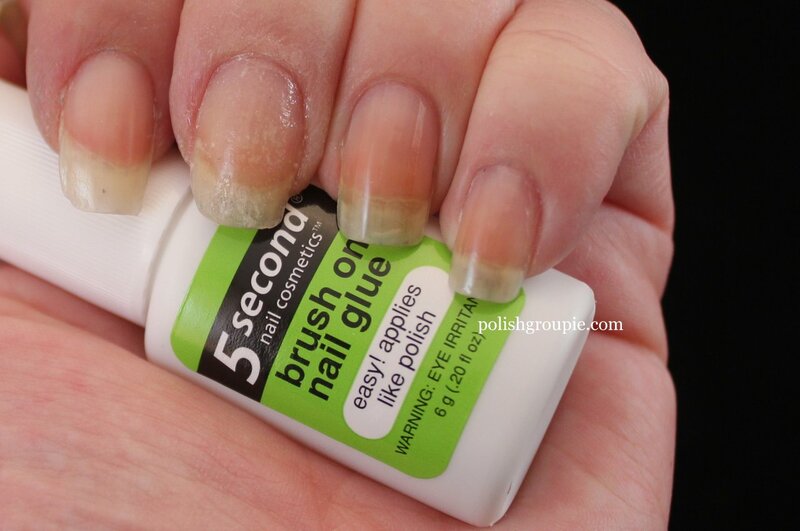 Apply nail glue to the entire surface of the nail, making sure you get plenty around the crack. 5. Place the cut-out tea bag paper on top of your nail, starting the the cuticle end. You can use your finger but you’ll likely end up with nail glue on it, so better to use the flat end of an orange stick to help get the paper to lay flat against your nail. You can also place a piece of plastic wrap over the nail and then press down on it as a way to protect the fingers of your other hand from getting gluey. 6. After the glue is dry, trim long end of the paper down so that it no longer hangs over the end of the nail. 7. Apply another layer of nail glue over the top of the entire nail. 8. 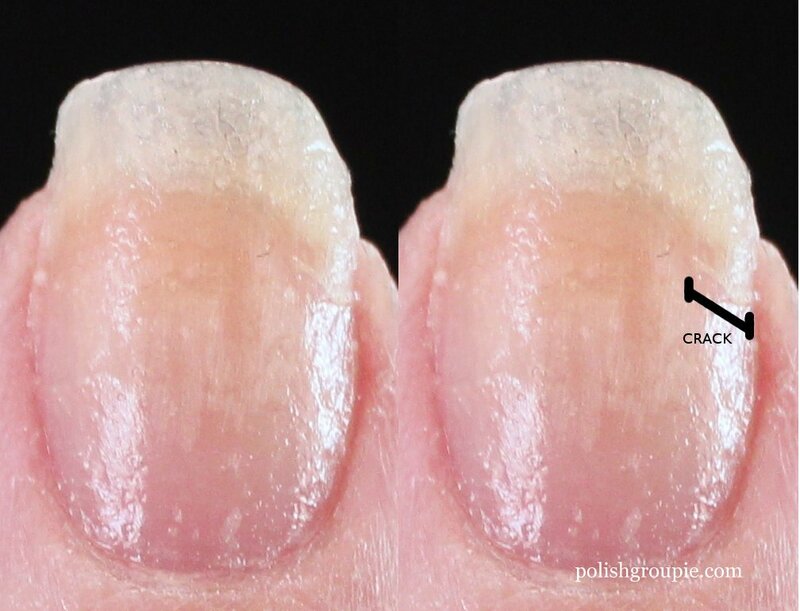 Once completely dry, use a fine grain nail file or nail buffer to smooth out the end of your nail and the top of the nail, which will be bumpy from the glue. You want to smooth it out as much as possible without removing too much of the glue or the paper, particularly in the area of the crack. Repaired nail before final buffing. The image on the right is marked to show the length of the crack, which is still visible beneath the paper. You can change your polish on the repaired nail using acetone-based nail polish, but if you use non-acetone, the repair will last longer, up to four or five polish changes according to the tutorial I used. 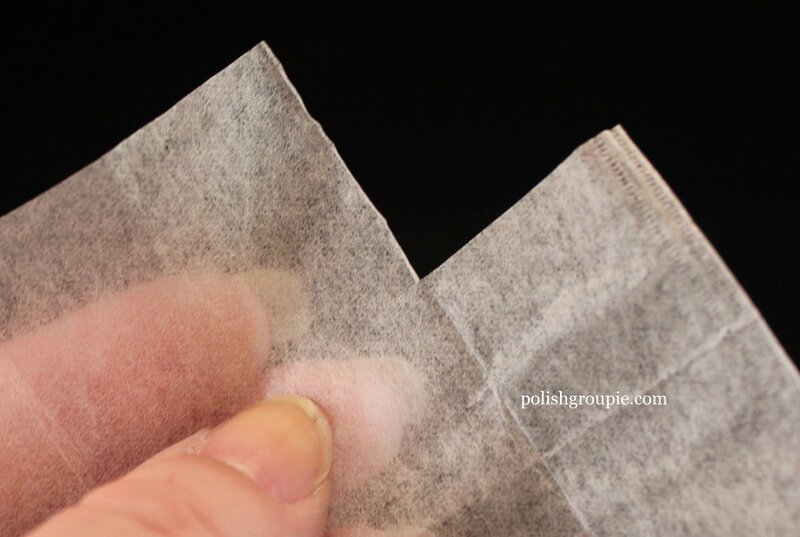 To remove the tea bag paper altogether, soak a cotton ball in acetone-based nail polish, put it over the nail and wrap the whole thing in aluminum foil. After 5 to 10 minutes, remove the foil, pressing down on the cotton ball as you do and the whole thing will come right off. I was a little too light-handed with the nail buffer first time out and didn’t get the nail smooth enough. You could really tell after I applied nail polish. But I took that off and buffed it again and now it’s much smoother. So far the repair seems to be holding up very well and the nail seems just as strong as all of others. I’ve added and removed polish twice using non-acetone polish on the broken nail without problems. Here’s the video tutorial I used as a guide if you need more visuals. I hope your nails never break, but if they do, this method of nail repair can get you back on track without a visit to the salon. Ugh! I have a split in my middle nail on my left hand. I will be working on repairing it, so no polish post tonight. Have you ever repaired a split nail with a tea bag? I’m going try, using the method shown in this tutorial. I’ll let you know how it goes. Wish me luck!